I was reminded the other day of how much my reaction toward a book can be affected by the audiobook narrator. An outstanding performance can make me love a book I would have probably abandoned in print. Of course, the opposite is also true, and believe me, I've listed to some painful audios that simply ruined the story for me. I'm not quite sure, but You Should Have Known by Jean Hanff Korelitz may fit into the former category. I was totally captivated by the audiobook, but I wonder if I would have been as fully invested if I had read this one in print instead. Here are my thoughts about the book in general and then about the audiobook. The general story: Couples therapist Grace Reinhart Sachs couldn't be more content. She has a successful New York practice; a talented, sweet son; a respected pediatric oncologist husband; and even a book deal. She loves the rhythms of her life in the city and considers herself one of the lucky ones. That is, until the day she learns something that changes her perceptions in unimaginable ways. Plotting and Grace: Because there is quite a lot of foreshadowing in this book, I expected few surprises and thought I'd ultimately be disappointed. But once I understood that Korelitz hadn't intended her novel to be a mystery as much as an examination of how Grace reacts as her world crumbles around her, the book held more promise. Grace's self-perception and her relationships with friends, family, and even New York City change as her reality becomes clearer. Although I liked Grace right from the beginning, my sympathy for her grew steadily as she faced her altered circumstances. Genre and themes: I want to call You Should Have Known a psychological thriller, but that's not really right. Perhaps a character study with a creepy side is a better description. Besides Grace's growth, Korelitz examines self-perception, friendship, marriage, motherhood, and parenting. She also makes us wonder how much we really know about the people we bring into our personal sphere and how we can judge who is telling the truth. 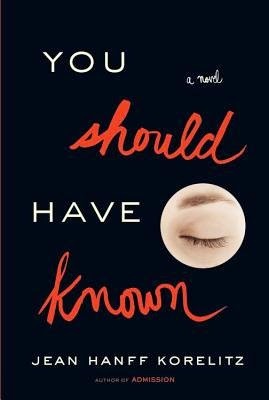 Recommendations: If you approach Jean Hanff Korelitz's novel as a character study instead of a mystery, you'll likely be caught up in Grace's emotional journey as she learns to cope with painful truths. If you're so inclined, I suggest picking up the audiobook instead of reading the novel in print. I just finished this book in print and I find your comments intriguing. I do think that hearing this read may have added a layer to my enjoyment of the book. I read Admission by the same author and really liked it so I've been wanting to read this book. I'll have to try to get the audio version. I keep hearing this one compared to Gone Girl. I enjoy character studies and have the feeling I'd like this book! I'm definitely going to find this one on audio, then. i am so intrigued tho i can't stay awake during audio books … i will give it a try .. thanks! I've had my eye on this book, and will definitely go with audio. Thank you for the recommendation. I have experienced this with audiobooks, too. I really want to read this but your reviews makes me want to check out the audiobook! I have this one in book format but may hold out for audio.